A number of years back I had the opportunity to take a class from Melanie Testa. I had read all of her books, watched her on Quilting Arts TV, and followed her work online. One of my friends accuses me of being a Fan Girl. I can't deny it, it's true. I am a huge fan of Melly's work! I have learned so much about surface design from her over the years. I feel fortunate that our art has brought us together as friends as well. In 2013 I had the opportunity to take Carol Soderlund's Dyeing to Discharge class, and I soon became a big fan of Carol's too. Carol's class was so well organized, and full of great information for dyeing and discharging. By the time the week was finished I was exhausted, but filled with new knowledge and fresh ideas for my surface design work. 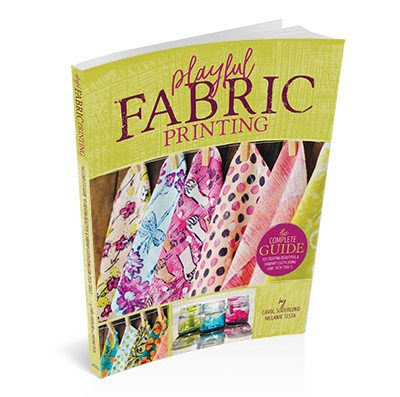 I was thrilled when I heard Melly and Carol would be working together to publish a book on printing fabric. They are the perfect artists to create this book. I have anxiously awaited it's arrival and I have not been disappointed. The book has arrived at just the right time for my own exploration of surface design. I actually feel as if they wrote the book just for me. Hopefully everyone else will feel the same way! 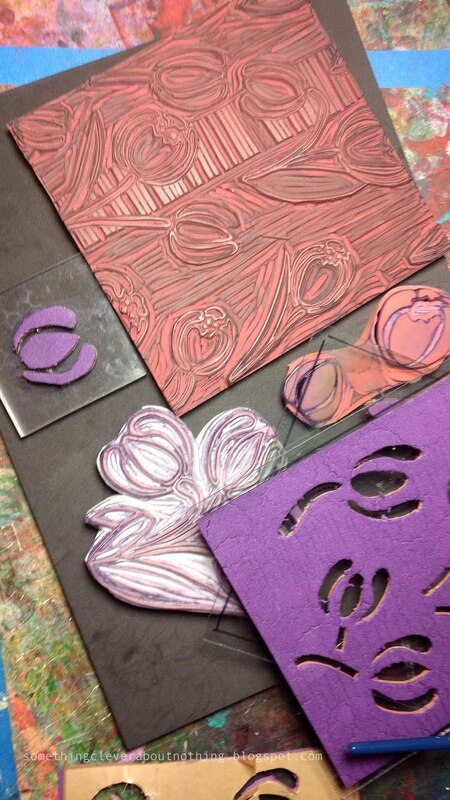 I have been creating a lot of stamps and working to create continuous patterns. Melly and Carol show a great way to create continuous patterns. One I hadn't thought of before. I am a bit obsessed with flowers and leaves. Recently I am loving tulips. 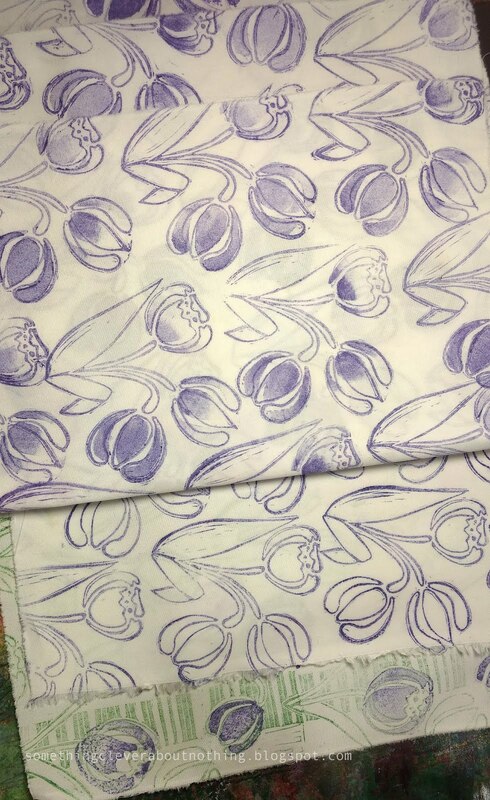 I followed the instructions outlined in the book to create some tulip fabrics by carving rubber stamps as well as cutting some foam stamps to use with the thickened dye recipes included in the book. 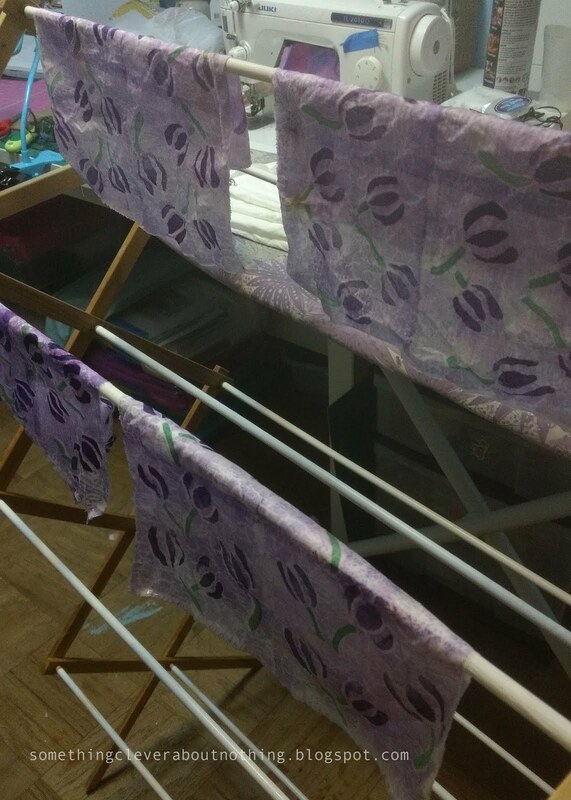 I do a lot of low immersion fabric dyeing but I rarely use thickened dyes to stamp on to fabric. 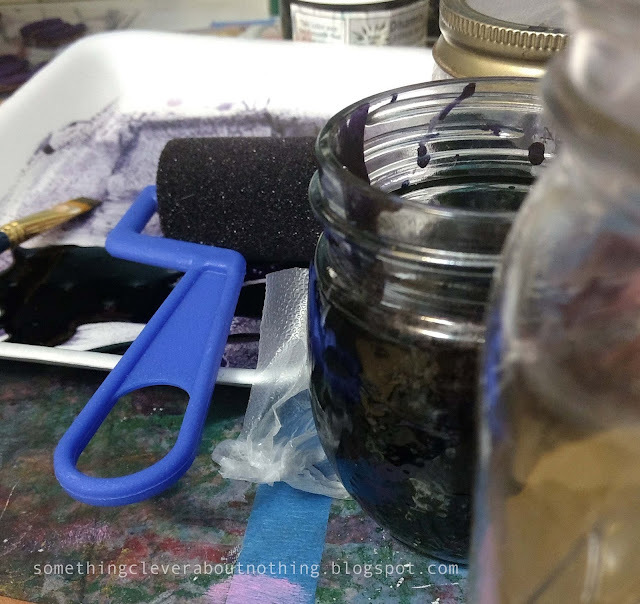 I usually use paints for that part of my surface design and so I was excited to learn how to create fabulous dye paste with exact recipes. One of the things I quickly learned, however, was that because I live in such a dry area, I probably should have bought print paste instead of using just sodium alginate! I was running short on time and wasn't able to order anything before the blog hop. The print paste you can purchase from Pro Chem or create with their recipe has urea in it which gives a longer open time to the dye. Fortunately I still managed to get some great prints. A three color print created with foam stamps. I am really happy with these prints! I'm not usually a fan of white backgrounds. My first reaction is usually, "OH I can overdye that!" I think these pieces will stay as they are. Before the fabric was rinsed, washed and dried. I like the softness of the finished colors in this monochromatic print. Final fabric after rinsing, washing and drying. I haven't quite perfected the continuous pattern for my large stamp (the bottom fabric with green) and so I'm not ready to show off the whole piece yet. I might have to carve another stamp or take a few things off. I haven't decided yet. In the meantime, I hope my post is getting you excited to create your own fabrics! 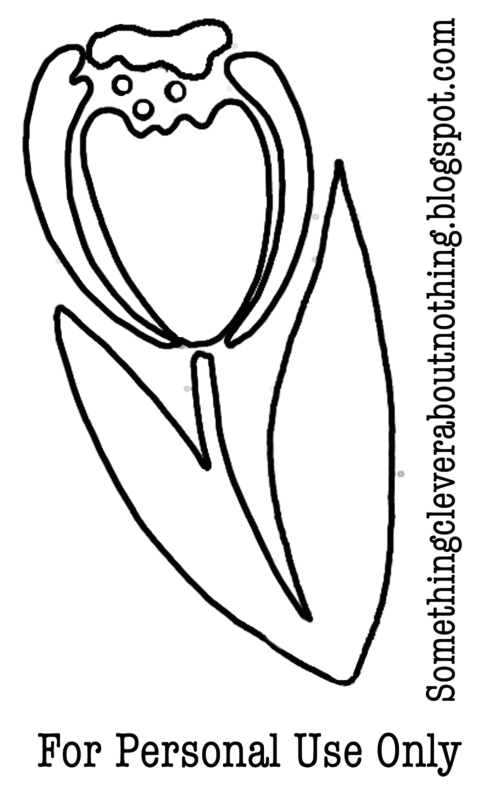 I've included a tulip you can use in creating your own fabrics. Just copy and paste or download the image and get started once you read Carol and Melly's book! Oh, what is that you say? You don't have their book yet? Well I know of ELEVEN ways you can get your hands on one! The first way would be to leave a comment here on my blog as to what your "go-to" motif or image is. As I said, mine are flowers and leaves. The next nine ways to get your hands on a copy of the book is to follow the blog hop and leave a comment on each of the other blog posts before February 7th. AND if you can't wait that long to see if you are a winner, the eleventh way to get your hands on the book is to hop over to Crafting a Life's webpage and purchase a book of your own. Here is the list of the other fantastic artists who will be sharing their impressions of the book. Click on their name to be taken to their blog. Jan 25: Lisa Chin - You are Here! Also, if you are on Facebook, join the Playful Fabric Printing Facebook Page and share photos of the fabrics you create. Tag me in any photos where you use my motif as I would love to see what you have created! I would say basic flowers for me like a tulip or a daisy. My go to motif is always a tree or leaf. And I'm excited about this book--I follow most of the blogs on this blog hop and that means lots of people whose work I admire are recommending the book. High praise indeed! I love flower and leaf motifs, but find myself carving things that are more geometric. My go to is leaves but I want to branch into some other marks for back grounds. Swirls whorls and twigs! I find it is hard to just create an idea to start but then it becomes easier after that. Doodling may be the key! Looks like a great book! Thanks for sharing. I love flowers and leaves as well but when drawing, I usually fall into a line drawing habit. I'll draw a shape, then fill it with straight or (slightly) wonky lines. It's a great way to free my mind + hand before trying to draw something a little more complex. Especially if I haven't drawn for a while. Thanks for the opportunity to win a book! Great prints! I love your Tulip stamp. I am excited to try it out on fabric after I make it. Thank you! I have a few motifs that are my go tos; dragonflies, flowers and fish. I am going to try out your tulip, it looks wonderful! I so want this book! Love the tulips that you printed! I agree with you Fan Girl, leave the background white! My favorite motif is the peace sign. I have not yet used the custom stamp you carved for me, but I will do so in the upcoming months. Thanks so much for all the inspiration! And the chance to win this wonderful book! My go to shape is a peacock feather, but I love leaves and flowers also. Thanks for sharing the tulip shape, great information also. I can't wait to see what other treasures are in the pages! My go to symbols are leaves and flowers with starfish a close second. Your tulip fabric is great! Love it! I often go to leaves or flowers such as cosmos. Lately it has been ferns, Queen Anne's lace and feathers. my go to is dots, I love dots! Lately, my motif is a leaf. My go to motif are birds, bluebird! I'm pretty new to fabric painting and design, so I don't know that I have a go-to design/motif. But I think I can say that my favorite is 'handwriting', which I get via a thermofax screen. Circles or leaves are my go to motif. I'm a bag maker and would use the printed fabric to make a one-of-a-kind bag. circles spots and scribble are my favourites for printing and stencilling. I am drawn to florals but use a lot of free form doodles. My go to motifs tend to be strong geometric patterns. I already have a lot of digital versions. I have been playing with Gimp, a free graphic design program, for years. In Gimp you can make simple to complex designs and save them as digital "stamps" that can be used over and over. When I came to Craft Napa I brought some printouts of my favorites and cut the shapes out of foam in Judy Coates Perez's class. Tomorrow I will start playing around to see how well they actually print. I love your stamp! And that's beautiful fabric you ended up with. I can't wait to get someday! Love the decilacy of you prints - beautiful on the white fabric! I like to use flowers, leaves, and also lines & shapes. Love your tulips! Also your fabric looks great! Your tulip fabric is lovely! I like to incorporate stitching, either real or faux, somewhere on my mixed media pieces. Wonderful floral design - I'm citing your article on pinterest! I would love a copy of this book. My go to motif is spirals - not sure why I love them so much, but they are always really fun for me. I love what you are doing - very inspiring! Your work is fabulous! My go-to are shapes and numbers. My favorite shapes are circular and Celtic. Thanks for sharing your knowledge. Beautiful design and this sounds like a neat book! Flowers are my go-to also! My go to motif are butterflies, either representational or abstracted. Have stamps and stencils. Must carve one with multiple images soon. Lisa, your tulips turned out so pretty. Gives me hope that springtime will come around someday :-) I'm not brave enough to use flowers and leaves... I tend to stick with abstract stuff like X's and circles and graphic lines. My go-to motif would be anything geometric, esp. spirals and teardrops. 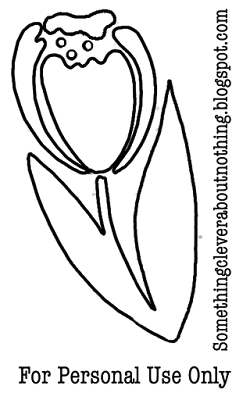 Thanks for the tulip design, great work! Your fabric turned out beautifully, and I'd love to win a copy of the book...Thanks for the chance! thank you for your tulip motif. I Wonder what I will do with it once I lay my hands on The Book! I'd love to win a copy. Being dutch of course i use tulips too with my own handmade stamps, but I love birds too in my créations. Thanks so much, Lisa, for the tulip image. Your prints are beautiful. My go to motifs are circles, chevron patterns, lines and other geometric patterns etc. I would love to win Playful Fabric Printing. Thanks for the chance! Spirals or koru (Maori art form) for me. I doodle them again and again. My go to symbol is a spiral. My go to images are flowers and butterflies. Thank you for the tulip image, I love it! My goto motif is circles. This is a shape I can actually draw! There are lots of options for this shape. I look forward to working with this shape with the materials this book suggests. I tend to use a lot of "X" marks in my work, so I guess that would be my go-to. Thanks for a look into your process, the tulip motif & a chance to win! This sounds like a very interesting book! I liked the tulips. I also love flowers, but really need to practice! Your tulip is lovely! Thanks. I always gravitate towards flowers and whimsical portraits.Thank you for the give away. Butterflies every time, I love all the different shapes that can be made into printing blocks or stencils. Anyone who knows me would say "cats" and "butterflies" and one of those "cats" is helping me type at the moment. I have given a lot of thought to your question about a "go-to" motif. I don't think I have one. I guess I'll have to work on that! 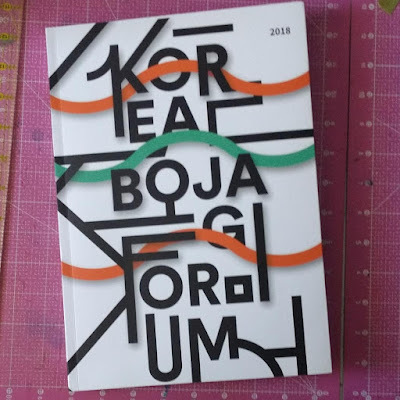 The book looks fabulous; I'd love to win it. I tend to gravitate toward paw prints. Circles happen all the time in my work. I love your stamps. 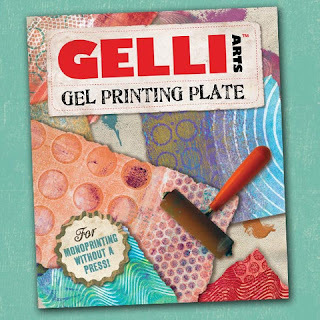 I'm anxious to try my hand at stamping and creating stamps. 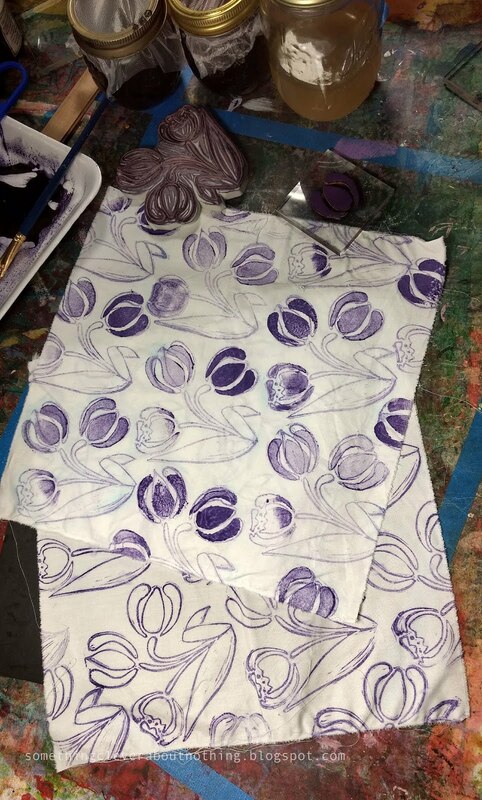 Very cool tulip prints! I love strong geometric shapes--circles, cruciforms, squares. Love circles and hearts! Your tulip print is calm, graceful and lovely! Your tulip print is so nice. Tulips are my favourite flower. I love it on the white background, it allows the print to stand out on it's own. I'd love to have a go at printing some flowers. Love your tulips. This is a fun blog hop.